There are many reasons why home and business owners would want to invest in Idaho Falls landscape remodels. The most obvious reason is that a quality landscape makes any property look great, making everyone feel more at home. A well-developed and maintained landscape is also a good way of increasing the property value of your home or business. Another common factor for why people choose to remodel their property’s landscape is that it has deteriorated or become damaged in some way. Over time, any property is going to run into problems and require an update of some form. Your property’s landscape is always growing and changing, and eventually the structures that have made it strong and stable will begin to break down. Our technicians know how to bring these structures back to their full potential, or replace them entirely with new and more efficient designs. If you have been considering upgrading your landscape and have found yourself in a position to do so, then our Idaho Falls landscape remodeling services will not let you down. We specialize in both hardscape and softscape services, the former being anything that involves hard materials such as rock and wood, and the latter involving organic materials. Our technicians are experienced and well-trained in landscaping services. 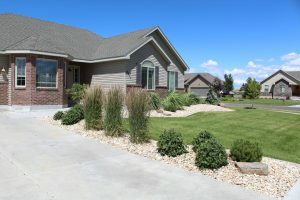 When it comes to Idaho Falls landscape remodeling, we know how to work with your property’s unique location, style, and design, making remodels that best enhance your property. We work with both hardscape and softscape areas of your lawn in a way that makes one compliment the other, adding to the beauty and utility of both. Whether it’s a retaining wall, stone walkway, or outdoor fire pit, we guarantee a finished product that is high in quality. Our technicians also know how to plant trees, bushes, and flowers so as to ensure their maximum health and beauty. 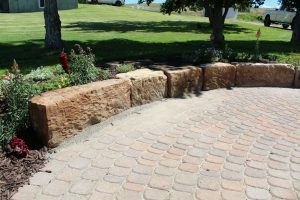 We can also set plants along walkways or retaining walls in order to soften their edges and give them more beauty and character, as well as remodel your garden and flower beds with stone structures that will give them greater definition and contrast them with the rest of your yard. We work quickly and efficiently to get the job done correctly the first time, and work with you all along the way to ensure that you are getting the results you have in mind. With so much experience communicating with our customers to create beautiful new landscapes, we guarantee quality service and results. New Leaf Landscape Design & Maintenance takes pride in the work we do for our local residents, creating beautiful yards for both private homeowners and business owners alike. Our services will help increase the beauty of your home, as well as elevate its property value, and business owners can also look forward to more customer attraction. For quality Idaho Falls landscape remodels, contact us today! New Leaf is a professional landscape design and maintenance company committed to meeting and exceeding our customer’s expectations. Great communication is the foundation of New Leaf’s quality service. Communication starts with listening to our customer’s needs and expectations and then responding to their requests.